Wynwood Arts District is the city's latest hotspot, but a group of dedicated artists continue to transform their neighborhood into a sprawling outdoor gallery. Wynwood was a rundown textile and manufacturing area. Then a cohort of street artists decided to bring attention to their neighborhood, but as a way to establish their own art. Slowly the area transformed into a haven for creative people looking for a way to express themselves. Soon enough, a developer purchased the properties and capitalized on the growing art culture in the gentrifying area now known as the Wynwood Arts District. While some were thrilled with the newfound injection of capital, others remained skeptical about the change. Native Robert de los Rios, founder of the RAW project, has been entrenched in street art scene in Miami for years, so he used this opportunity as a way bring art to underfunded schools in the area. 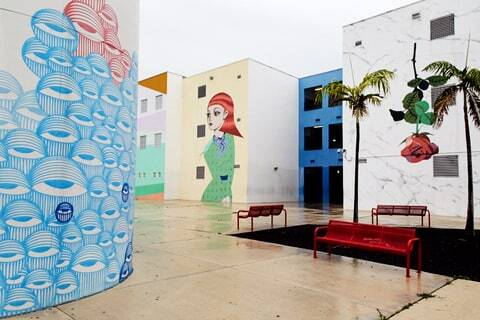 "Art budgets for schools in the Wynwood area were slashed to zero," Rios says. So he decided to approach the area school district and street artists from around the world to paint murals on the indoor and outdoor walls of the school. By doing so, Rios hoped this would jumpstart the issue of funding art in schools again and to inspire kids' creativity. "They felt like they were coming to a prison before," he says. "But now they come to school excited and happy. "The outdoor walls at Wynwood's Jose De Diego Middle School have been transformed into huge canvases, each meticulously painted, with some murals focusing on typography – inspirational statements, like "Believe" – and others featuring more illustrative work. While Rios prides himself in being able to bring an international graffiti scene together to transform the aesthetic of the school, he also collaborated with multiple Miami artists – Ahol Sniffs Glue, Typoe, Santiago Rubino and FL.Mingo – to bring challenging concepts to the school's campus.Typoe, one third of an art collective known as Primary Flight, along with Cristina Gonzalez and Books Bischof, started in Wynwood when Art Basel launched in 2007. Having no luck at the fair, the trio decided street art was more lucrative. "We were just getting the exposure for ourselves," Bischof explains. "It was born out of necessity, and that's the foundation of its success. It was needed." Now they have a gallery space in the Design District and Typoe receives commissions to create art for various clients, while Bischof and Gonzalez have moved onto to artist representation. Jose De Diego Middle School, murals by (from left) Ahol Sniffs Glue, Santiago Rubino and Typoe (far right). David Cabrera for Rolling StoneAhol Sniffs Glue (real name David Anasagasti), whose signature mark is repeated spray-painted droopy eyes, started painting "for the fun, for the fame, for the rush." Santiago Rubino, born in Argentina, has a more melancholic tone and he attempts to explore the mysteries of life, leaving the viewer to question everything. "I always challenge myself … it's all problem solving," he says, referring to himself as a "masochist. "While Typoe, Ahol and Rubino have switched mediums and currently focus on selling their artwork to collectors via indoor galleries, some street artists still prefer creating their work in a quasi-legal environment. FL.Mingo, for example, still works in the streets by tagging in Miami train yards.FL.Mingo has remained anonymous to this date since, for her, tagging is her primary medium. "This is illegal, and I've already been to jail for it," she tells Rolling Stone, while keeping her face covered and asking for her identity to be kept secret. "I have to stay anonymous, my face especially. I can't put my face out there. … They'd be knocking at my door tomorrow." She continues to use her flamingo with a crown symbol because she says she needed something more recognizable and more "Miami." FL.Mingo artwork is still featured at the Wynwood Walls area, but to Mingo, that's not the real Wynwood. "It's mostly out-of-towners painting murals," she says. "When we were painting it, it was illegal graffiti all over the place. You can have Wynwood, but we still have the rest of Dade County. ... I'm not going to forget where I came from."